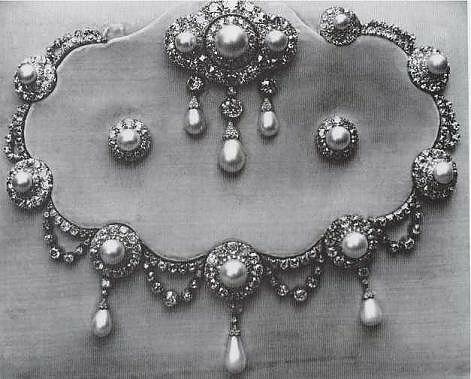 Albert Edward, Prince of Wales - son of Queen Victoria and the future King Edward VII - purchased a magnificent parure for his bride, Princess Alexandra of Denmark, as a gift for their 1863 wedding. The set from Garrard included a large diamond tiara plus a diamond and pearl necklace, set of earrings, and brooch. 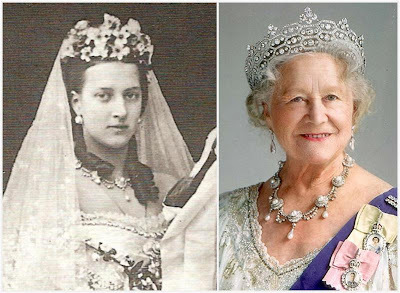 Alexandra wore the brooch, necklace, and earrings on their wedding day and she continued to wear the set for important occasions throughout her life. The tiara, popularly known as the "Rundell" Tiara, no longer exists (read more at Order of Splendor); the rest of the parure was split between royal ladies for a time but is now reunited in The Queen's collection. Also known as Queen Alexandra's Triple Drop Brooch, this brooch has three large pearls set button-style in diamonds and three pendants with diamonds and drop pearls. The center part of the brooch and the three pendants are detachable. Queen Mary inherited the brooch (as well as the necklace and earrings) and it was subsequently inherited by The Queen. The Queen wore it in 1972 and it didn't appear again until 2014. Also known as Queen Alexandra's Cluster Earrings, these two button earrings have large pearls surrounded by diamonds - 10 larger stones each plus smaller filler stones to create a full diamond ring. Like the brooch, these passed to The Queen via Queen Mary. They're now worn primarily at evening functions. 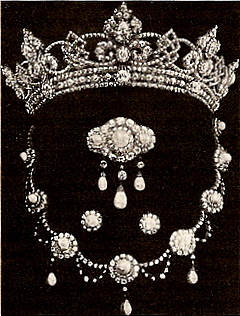 The necklace features 8 pearls surrounded by diamonds, each connected with festoons of diamonds, and three detachable diamond and pearl drop pendants. 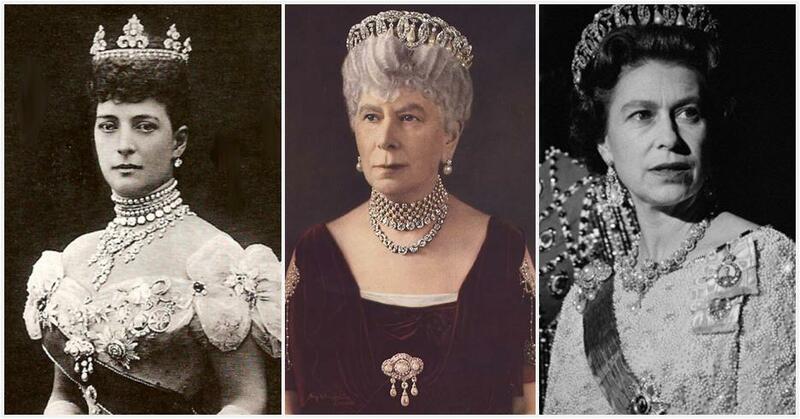 Queen Mary gave the necklace to Queen Elizabeth The Queen Mother, and she wore it constantly. 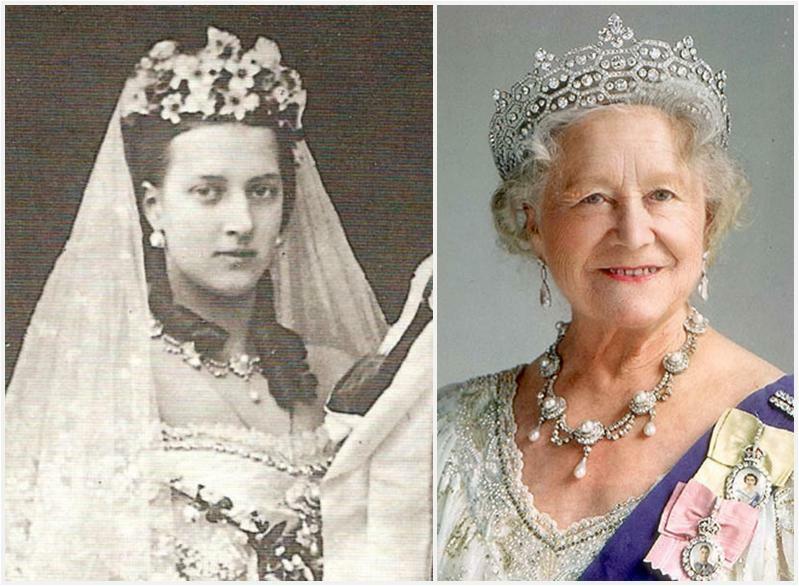 The necklace was finally reunited with the brooch and earrings when The Queen inherited it in 2002. It was next seen publicly when it was loaned to The Duchess of Cambridge for the Dutch state banquet in 2018.